Our fall steelhead season flew by quickly in Southwestern Ontario. A reflection of low water conditions, many rivers saw poor returns. Low water has affected our winter steelhead, too. When we have high water our rivers normally fish in mid winter. Meanwhile, with the low water we have now many of our rivers locked up with ice. Fortunately, I can see a fishy spring on tap, even if finding open water to fish in our rivers is a chore now. There are still opportunities to catch steelhead in open water this winter, but they are limited mainly to larger rivers that don’t ice up as quickly or the shorelines of our Great Lakes. For open water your best bet is to fish bigger systems (like the Niagara) and avoid the smaller, ice-covered ones unless you plan to ice fish. Fortunately in Southwestern Ontario there are opportunities to catch steelhead on just about every river system, whether it’s iced over or not. The Niagara boasts good winter runs and has open water. West of Toronto, rivers such as the Humber, Credit and Bronte hold numbers of winter steelhead, as do systems to the east of the city to Kingston. If your local river is frozen and ice fishing isn’t your thing plunking with floating roe bags on the shoreline of Lake Ontario, Lake Erie, Lake Huron and Georgian Bay is a sure way to catch steelhead, although it can be cold. Some steelhead hang out in shallow water near river mouths from September until May providing shore fishing opportunities at any given time. You can catch steelhead ice fishing. 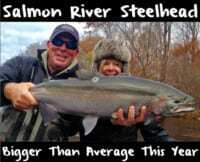 Rivers locked up in deep stretches hold steelhead throughout winter. In fact, many spring run fish hold in deep pools during the winter months until the water starts to warm up. Harbors and marinas provide ice fishing opportunities for these fish, too. 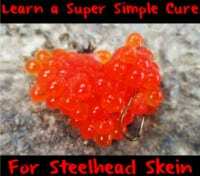 To catch them you can fish cured roe off the bottom or suspended under a float. Shiners, wax worms, flies and jigs can be used through the ice as well. Remember, there is no such thing as safe ice. Always test holes to check for ice thickness and try to fish with a partner. When fishing the winter good bait and strong scent plays a crucial role in putting extra fish on the bank. I have always preferred skein over loose roe because of how soft it is and how much milk it releases. When you are fishing in slow moving water, or in the lake, these fish have a few extra seconds to inspect your offering before they commit. Skein will milk slowly while you’re in the strike zone, whereas loose roe does not milk. I like to cure my scraped trout or salmon skein with a generous amount of Orange or Natural Fire Cure or BorX O Fire. Remember, you can keep cured roe in your fridge for a month before it slowly starts to go bad. Whether through the ice or on open water I always steelhead fish in the winter. Remember to layer accordingly to prevent moisture when spending a day out in the cold. Try to keep extra clothes in your car for times when you get wet or for extra layers. It’s better to overdress than underdress. I recommend insulated rubber boots with good socks if you are going to ice fish. If you’re wearing waders keep boots tied as loose as possible to allow good blood circulation. Layering makes you feel more comfortable in harsh elements and comfortable anglers usually catch more fish! 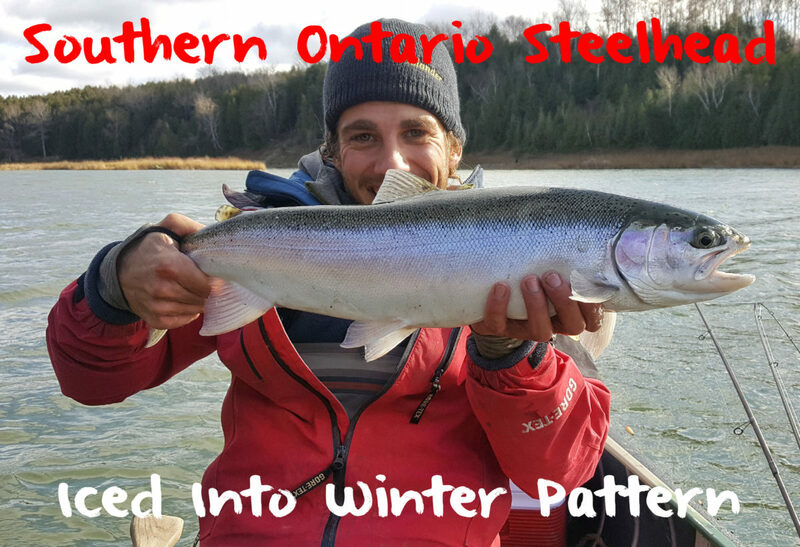 Editor’s Note: Bojan Zivkovic now offers guided Southern Ontario walk-in steelhead trips. For more information on Angle With Bojangles Guided Walk N Wade Excursions please visit https://www.facebook.com/anglewithbojangles.